Do you to want to know what good ideas are solving problems around the world? Here is a selection of some inspiring news from March! The voices of about 30 black Nova Scotian children are reflected in a new ABC book, R Is For Reparations. The children wrote and designed the book after learning about reparations — an international movement from many black communities seeking repair and compensation for the injustices and horrors of the Atlantic slave trade and anti-black racism. The ramp had such an impact that, when it came time to spruce up Second Street the next year as part of an ongoing downtown-revitalization process, the city decided to make the accessibility it provided part of its built infrastructure by raising the sidewalks. Anderson says that he’s seen StopGap lead to policy changes in various municipalities but that Kenora is the first to have made this kind of structural change. In the most ambitious project to date, the Estonian Ministry of Justice has asked Velsberg and his team to design a “robot judge” that could adjudicate small claims disputes of less than €7,000 (about $8,000). Officials hope the system can clear a backlog of cases for judges and court clerks. The Anxiety Meter translates a user’s heart rate into their anxiety level so that the user and their care team can know when to apply relaxation strategies. It is part of a system that will allow care teams to have access to the most up-to-date strategies, and to share important information about potential triggers. The village of Mankosi has been at the forefront of an experiment to bridge the internet gap and make cheap WiFi a reality. And it’s a project that could have major implications for similar communities around the world. The key is to balance the basic needs—shelter, food, and healthcare—with the effort to promote artistic expression that helps urban communities process trauma and communicate and document their experiences. In Medellín, punk music, breakdancing, and mural art emerged parallel to the physical improvements in the city’s marginalized comunas—and later became draws for tourists. Human composting would be a much greener after-death option, as it uses 1/8 the energy of cremation, and for every person who picks it over cremation or burial, it will save over a metric ton of CO2. Like any animal body, humans contain a lot of protein and moisture. In order to help them quickly break down, they are placed in a vessel with oxygen and plant materials, such as wood chips, alfalfa, and straw. Entire industries died — like oil exploration and gas furnace manufacturing. Others rose to take their place, as the country rebuilt its electrical systems. People didn’t know what would happen and they were scared. The changes only moved ahead when people were convinced that they weren’t getting ignored and left behind. It was the political struggle of a generation. in February, you can make a windsock to appreciate the speed of the wind. In March, you can make beach art from natural materials. In April, you can make a bug hotel. In May, you can bury your face in the grass. In July, you can pick two different kinds of grass and really look at them. In August, you can summon a worm out of the ground without digging or using water. In September, you can help clean the beach. In October, you can appreciate a cloud. In November you can talk to a pony. In December you can feed the birds in your garden. All on doctor’s orders. 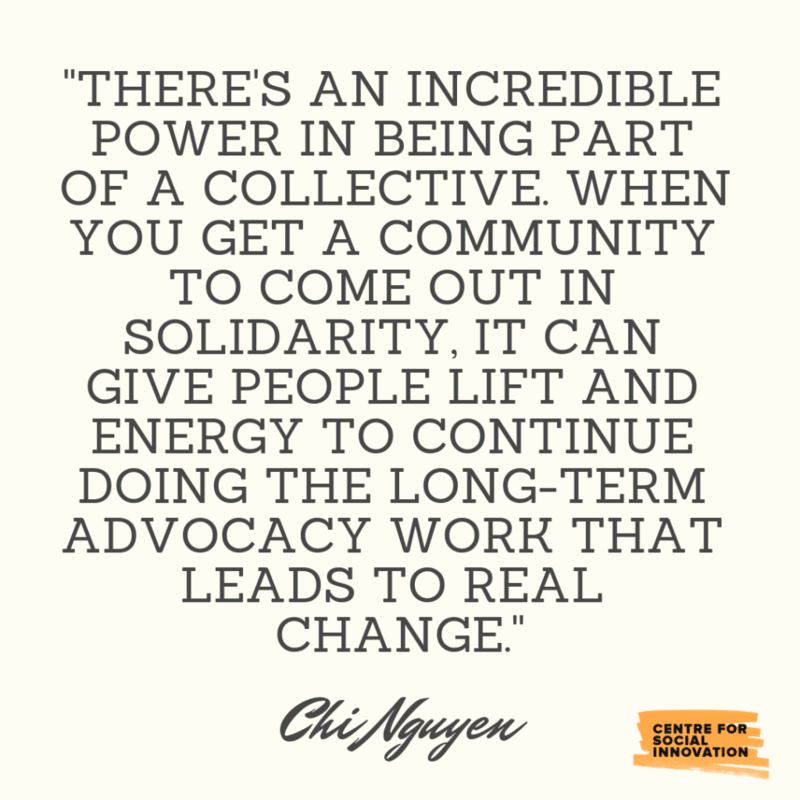 Advice on lobbying for the causes you care about from Social Innovation Canada‘s Director of Social Innovation Chi Nguyen. Get workspace + community in exchange for working at CSI one day a week! Winter biking tips from Cycle Toronto! Every so often a member comes along that has a profound impact on our own work and thinking. CSI Member and Agent of Change Luke Anderson is shifting the landscape around accessibility and inclusion. His remarkable story and efforts to make cities across Canada barrier free profoundly moved us, so we made this short documentary with the support of Bell Fibe TV1. Watch it now and please share it! CSI's accessibility work done with the support of the Ontario Trillium Foundation.